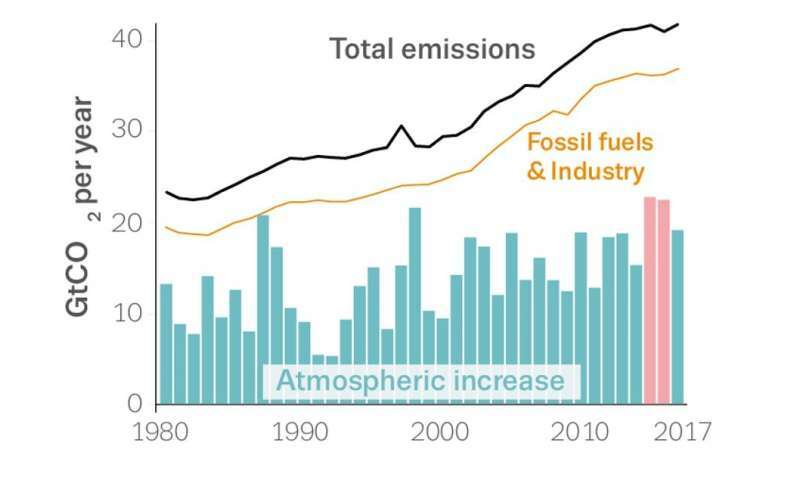 But this year's figures suggest that the keenly anticipated global peak in emissions – after which greenhouse emissions would ultimately begin to decline – has yet to arrive. In a series of three papers, the Global Carbon Project's 2017 report card assesses changes in Earth's sources and sinks of CO₂, both natural and human-induced. All excess CO₂ remaining in the atmosphere leads to global warming. We believe society is unlikely to return to the high emissions growth rates of recent decades, given continued improvements in energy efficiency and rapid growth in low-carbon energies. Nevertheless, our results are a reminder that there is no room for complacency if we are to meet the goals of the Paris Agreement, which calls for temperatures to be stabilised at "well below 2℃ above pre-industrial levels". This requires net zero global emissions soon after 2050. 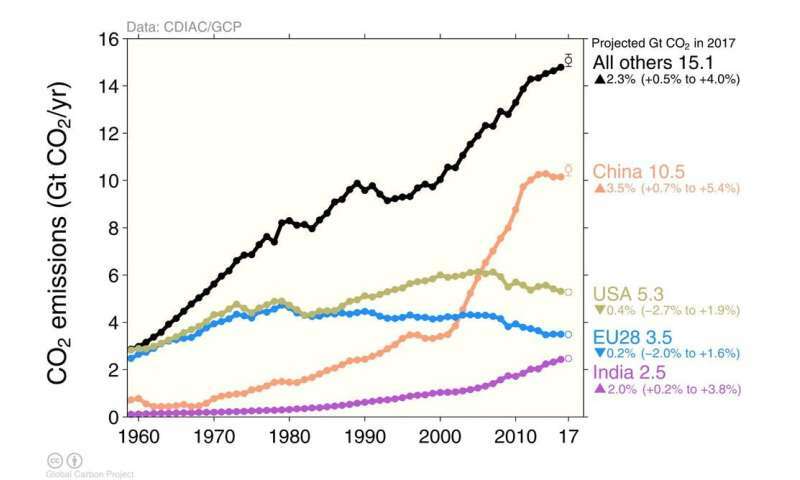 The most significant factor in the resumption of global emissions growth is the projected 3.5% increase in China's emissions. This is the result of higher energy demand, particularly from the industrial sector, along with a decline in hydro power use because of below-average rainfall. China's coal consumption grew by 3%, while oil (5%) and gas (12%) continued rising. The 2017 growth may result from economic stimulus from the Chinese government, and may not continue in the years ahead. Unexpectedly, India's CO₂ emissions will grow only about 2% this year, compared with an average 6% per year over the past decade. This reduced growth rate is likely to be short-lived, as it was linked to reduced exports, lower consumer demand, and a temporary fall in currency circulation attributable to demonetisation late in 2016. Yet despite this year's uptick, economies are now decarbonising with a momentum that was difficult to imagine just a decade ago. 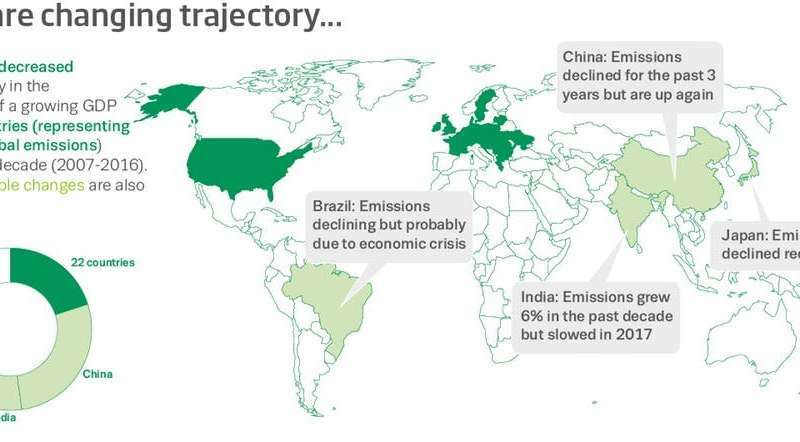 There are now 22 countries, for example, for which CO₂ emissions have declined over the past decade while their economies have continued to grow. 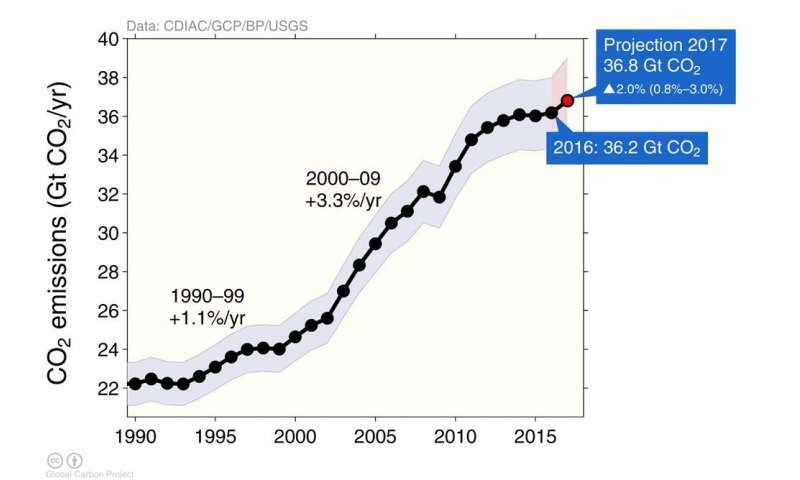 During the three-year emissions "plateau" – and specifically in 2015-16 – the accumulation of CO₂ in the atmosphere grew at a record high that had not previously been observed in the half-century for which measurements exist. It is well known that during El Niño years such as 2015-16, when global temperatures are higher, the capacity of terrestrial ecosystems to take up CO₂ (the "land sink") diminishes, and atmospheric CO₂ growth increases as a result.